Remember Calmer? When it was discontinued did you gather up a stash (after weeping of course) and hoard it? Or maybe you didn't and now regret it? Or perhaps you've never heard of it? Dear old Calmer is one of Rowan's best yarns ever. I went into a buying frenzy when I hear the bad news that it was being discontinued (that was years ago) and bought 20 skeins of off-white and some navy. I am slowly allowing myself to use them when the right pattern comes along. 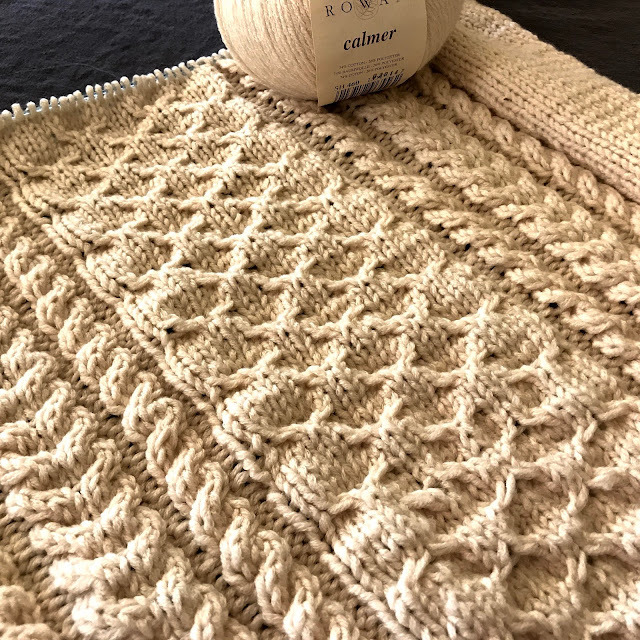 The Calmer love is simple: besides being super soft to knit and wear, it makes a stretchy and squishy fabric with zero itch factor and a slightly sueded feel. It has an uncanny elastic/snappy way of knitting up with a pleasantly doughy feel on the needles. It's like no other yarn I've ever knit with. Recently, I felt that Camello came close to this snappy elasticity; totally odd because the fiber content is so different. Calmer is cotton and acrylic and for the life of me I don't know why it's as fabulous as it is. 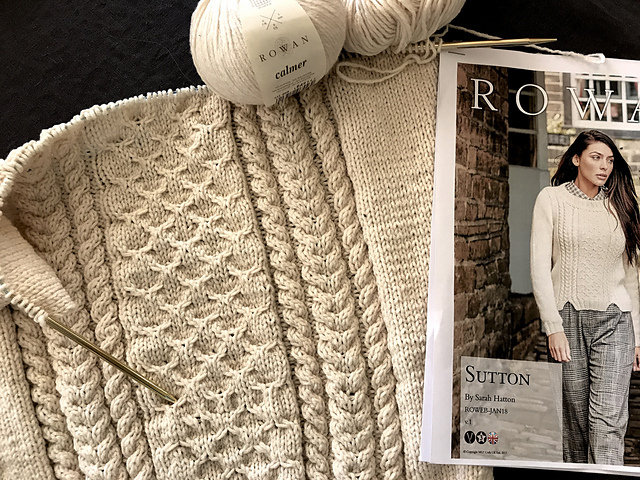 With my precious Calmer I knit Sutton, a free download from Rowan designed by Sarah Hatton, definitely Calmer worthy. 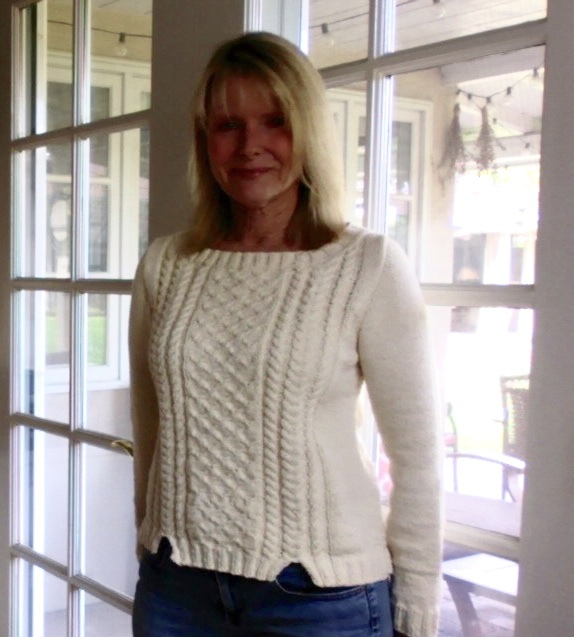 I love cables but don't care for the big, fluffy polar bear effect a cabled sweater often gives. I've overdone cables before, and felt overwhelmed by them. But Sutton has cables on the front only, leaving the sleeves and back in stockinette. I love that, and also love that the cables are small and delicate. The cable pattern itself is an easy-to-memorize 8-row repeat and very fun to knit. The shape is boxy, which I kept, but it would be easy to modify to add waist shaping. I love it. 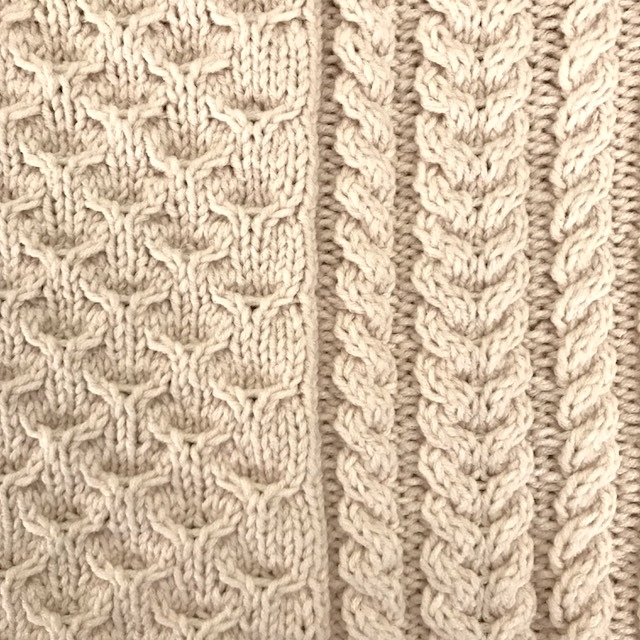 I made two modifications: I knit the sleeves in the round, set-in and top-down, always my preferred sleeve technique. 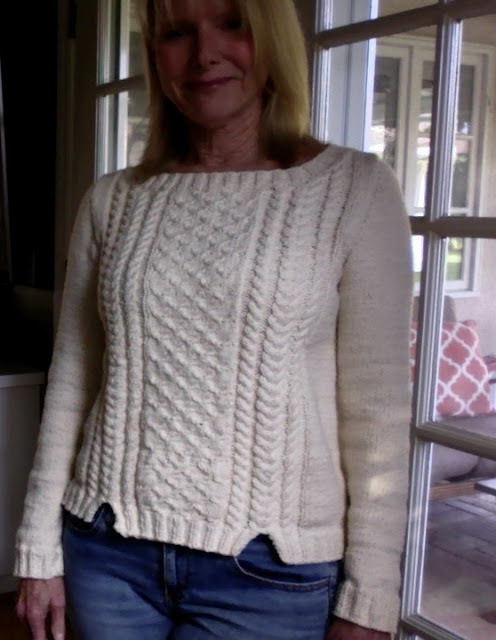 I also substituted a classic 2x2 ribbing for the fussy-sounding neckline. 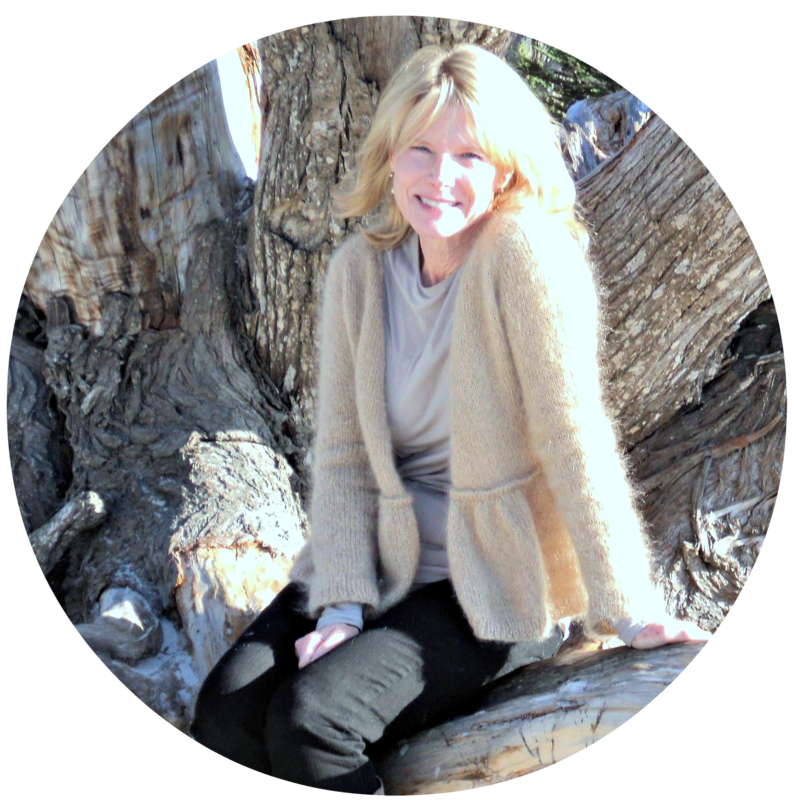 Sorry for the recent grainy, dark pictures that I've had on this blog lately. These are the photos I get when I stand in front of my computer and use photo booth. 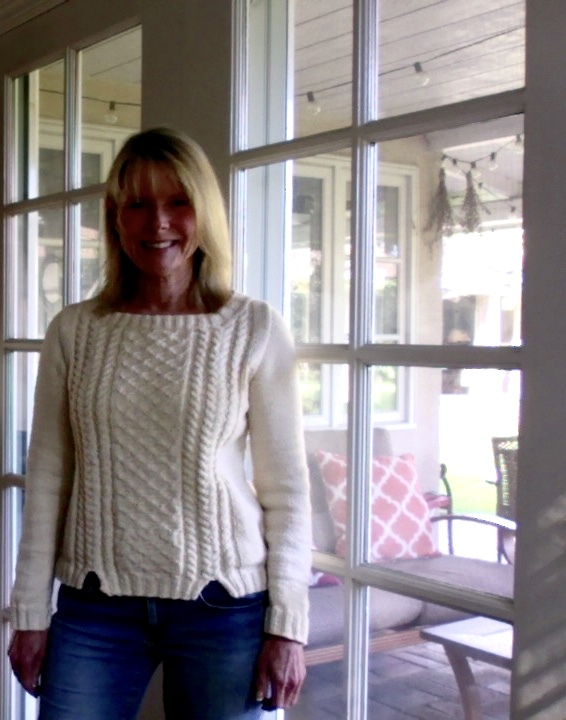 But it does at least show the fit of the sweater well enough and I think that's the most important thing to show. 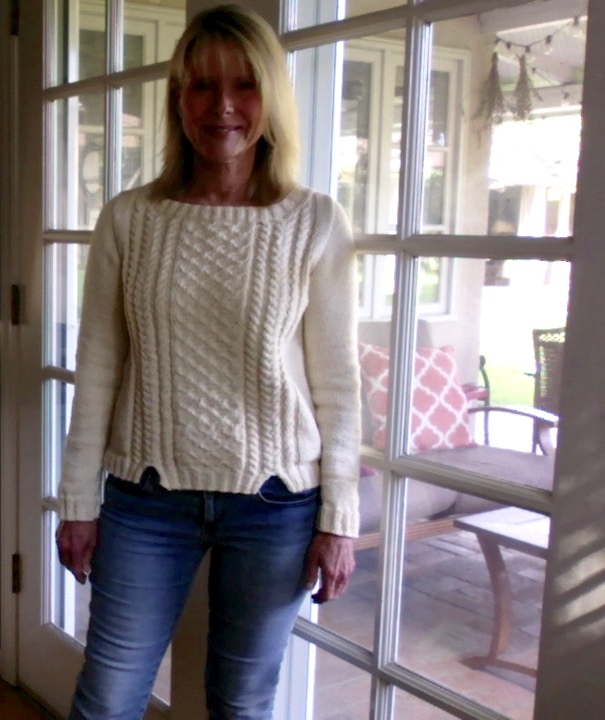 This will have to do for awhile as it's not easy for my husband to photograph me as he's still on his knee scooter after his surgery. We hope to give the scooter the heave-ho in a few weeks. For those of you who celebrate Easter, I hope this Easter holiday fills your home with peace, joy, and plenty of colorful Easter eggs. 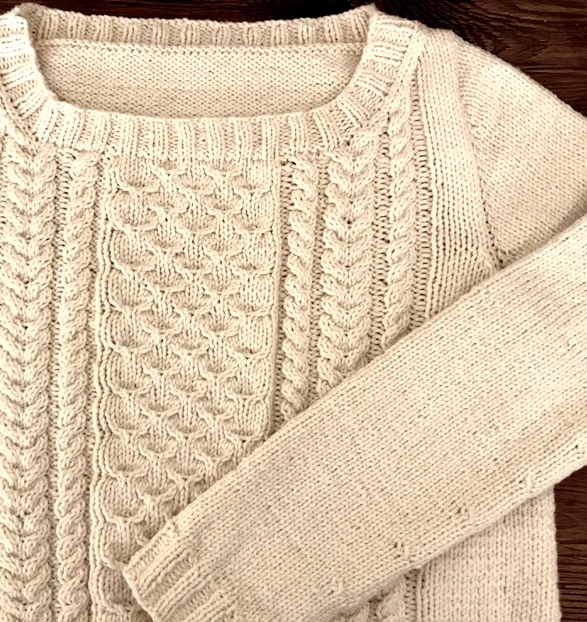 Sutton Pullover by Sarah Hatton, free download. The pattern calls for Kid Classic which is readily available. To leave a comment, please click here. Looks just beautiful! You did a wonderful job. 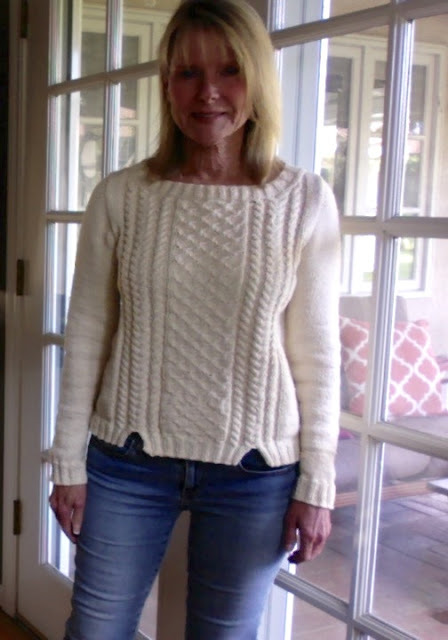 Love this pattern, Kristin. The overall silhouette. The neckline. The length. So flattering And - as usual - you have done it justice. Beautiful. Chloe.